It's interesting where the internet will take you... I started out today wanting to write a blog entry about a picture I took of what I thought to be belladona, or deadly nightshade, growing in a hedge on campus, and then to talk about how cool belladonna is. However, I looked at my pictures, and then at the entry for Deadly Nightshade (a.k.a. Atropa Belladonna) on Wikipedia, and the flowers and the berries look a little bit different than this poisonous plant. Anyway, I have a few reasons to be interested in nightshade, one of which is that the Deadly Nightshade sleeves I knit a couple of months ago are based on that plant. 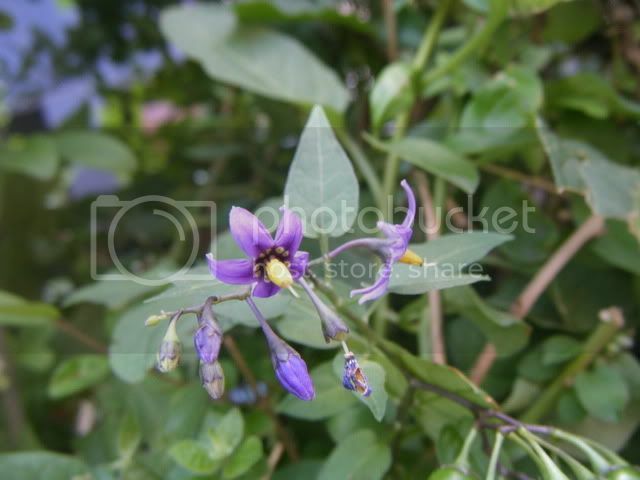 Another is that nightshade is in the same family as tomatoes, potatoes, peppers, and eggplants. The main toxin in bittersweet nightshade is solanine, which is present in small amounts in all of these, I think, especially potatoes that have been exposed to light for too long. I'm fairly allergic to eggplants. When I eat enough of them, I get a stomach ache and a sore throat, and it feels like my airways are closing up, which, according to ehow, means I should go to the emergency room when I have a reaction. I'm not sure if it's the solanine in eggplant that makes me sick, but I've never had any problems with other members of the Solanum genus. So this lead me to research eggplant allergies, which are apparently very rare, and this lead me to this article talking about a study performed in India on a guy who was allergic to eggplant... and then I got bored, played Mah Jong for a while and fell asleep. It only took all day. Solanaceae are indeed very cool. I am under the impression that all solanaceae contain anticholinergic tropane alkaloids. Solanine is not actually a tropane alkaloid but a glycoalkaloid acting on calcium channels & precipitating cellular death; it deals non-specific damage to nerve cells, but at normal concentrations (in a healthy ripe plant) it's not very dangerous. 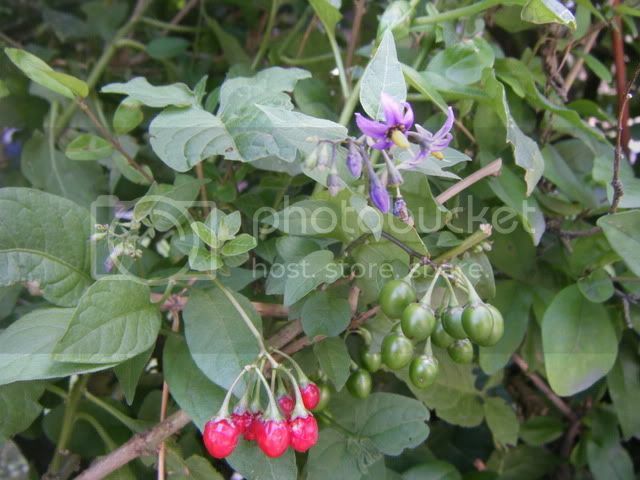 Deadly nightshade, on the other hand, is particularly poisonous because it contains a high concentration of atropine. Atropine is a competitive antagonist of acetylcholine receptors, meaning that it prevents the regulatory functions of the parasympathetic nervous system from occurring at the pre- & post-ganglionic level, leading to widespread dysfunctions & eventually death by cardiac or respiratory arrest (or any number of complications pertaining to anticholinergic action in the brain). I am amazed that anyone would ever think of imbibing atropine recreationally; might as well shoot up with curare. Though it's difficult to tell which solanaceae alkaloid you might be allergic to, it is most likely not solanine. It seems that eggplant would only ever contain trace amounts of the stuff, & so if you were specifically allergic to solanine you would more than likely be allergic to most if not all of the solanaceae. It seems to me more likely that you (& possibly myself also, as pertains to my tomato allergy) are allergic to a very specific tropane, or possibly to a chemically inactive constituent of the plant. Allergies often make limited sense. I think such allergies are probably advantageous from an evolutionary perspective -- aversion to solanaceae means reduced likelihood of tropane alkaloid toxicosis, so we may think of ourselves as evolved beings. In modern Congo, a similar allergy to cassava might have prevented some people from becoming paralysed.